Digital technologies are poised to have fundamental impact on innovation management. 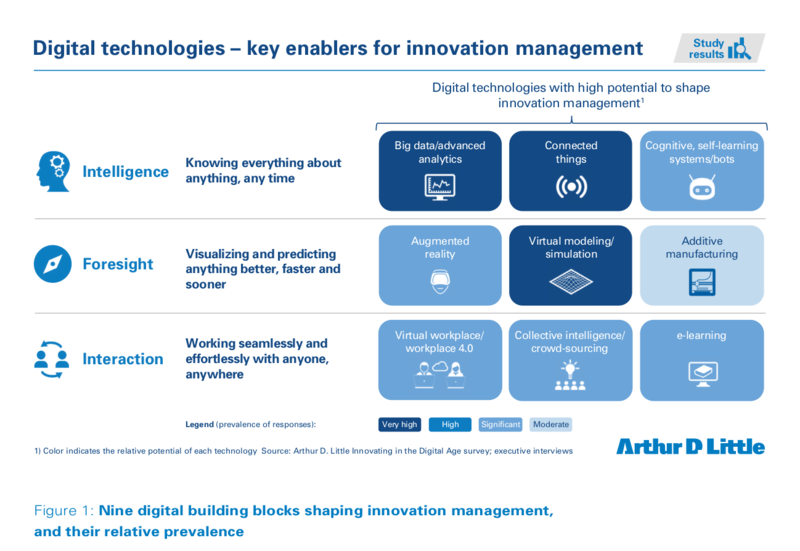 Drawing on a unique global study carried out by Arthur D. Little, this article explains the three areas where digitalization will impact innovation management, the state of adoption, perceived benefits, and the risks to organizations that are left behind. Accepted wisdom is that everything that can be digitalized, will be. While this may be an oversimplification, there are few limits to the march of digital technology. So what does all this mean for innovation management practices? To answer this, Arthur D. Little conducted an extensive study, looking at which digital technologies would have the greatest impact on how innovation would get done, now and in the future. The principle finding is that change is happening now and winners anticipate enormous benefits, with a predicted doubling of innovation success. Secondly, laggards need get their act together soon. If recent history has taught us one thing about digital technology, it is that it does not forgive those who are slow to act. This article not only explores the research, but also provides strategic advice for successful digitally enabled innovation. In 2017 Arthur D. Little launched a unique, global survey to understand which technologies would have the greatest impact on how innovation would get done, now and in the future. Over 150 senior executives in innovation, R&D and technology shared their views, while the study also analyzed over 300 tools and investigated hundreds of real-world application cases of digitally enabled innovation. What is digitally enabled innovation? Until recently, businesses have focused their digitalization efforts around disrupting business models and streamlining processes. But what does it mean for internal innovation activities? We can start with a definition. We see digitally enabled innovation as the use of digital technology to improve innovation (management) practices, for example, by changing how development teams collaborate, or widening the data available to them. Our research found that while most companies were early in the process, the vast majority anticipated a rapid and dramatic increase in the degree of digitization in both their innovation engines and product offerings in the next three years. This is especially noteworthy, given that a fully fledged overhaul of a company’s innovation engine may take longer than a single three-year planning cycle. Best practice is already emerging, including focused experimentation with digital solutions to increase both the efficiency and effectiveness of innovation management. This pace of change means those that are not investigating opportunities to digitize are likely to be left behind. Interaction: Working seamlessly and effortlessly with anyone, anywhere. An in-depth review of real-world use cases reveals that the most widely used digital building blocks are those that fall under intelligence and foresight – the third area, interaction, is less prevalent. This is because concepts such as big data, connected things and simulation are well known and provide proven competitive advantage. Interaction technologies are generally at an earlier stage of development, which means their potential impact is less clear. This is not surprising, as human interaction is inherently complex and the adoption of technologies to foster interaction requires behavioral change, as described in our recent article on driving adoption in digital transformation (Issue 1, 2018). Nevertheless, based on our survey results, we expect digital technologies for interaction to be the cutting edge of digitally enabled innovation in the next five years. Artificial intelligence (AI) is changing the way open innovation takes place. AI enables more accurate evaluation of problem root causes and identification of key areas to focus innovation efforts, which helps companies to narrow down their focus area for innovation. Moreover, AI can support the search for potential solutions to solve the identified causes by collecting available information from scientific publications or checking existing solutions in patent databases. Machine learning enables potential solutions to be tailored to the capabilities and preferences of the organization. This will help companies to shift from crowd-suggested/crowd-scanned open innovation strategies to ones that are more targeted and tailored, ultimately boosting the efficiency of outside-in ideation while keeping the advantages of open innovation. This has a significant positive impact on the R&D costs for innovation. A digital twin is a virtual representation of a physical system. Digital twins enable companies to engage in product-centric, model-based innovation processes. Thanks to the usage of IoT sensors, digital twins can receive real-time data, process it and accurately simulate the results of physical interventions. While the concept of a digital twin is not new, progress in high-performance cloud computing allows far more realistic modeling, and AI enables twins to learn autonomously and recommend interventions. Furthermore, the models can be experienced within virtual reality, which enables developers, designers and even early-stage customers to get sneak-peaks at to-be innovations purely created within digital twins. This adds a second layer to the simulated results of physical interventions and extends the digital-twin application to product design. The combination of a decentralized collaboration platform and the use of blockchain technology can enable companies to cooperate and evaluate potential ecosystem partnerships in the innovation process. Blockchain technology can create trust among partners that do not have trust-based business relationships yet, but rely on exchanges of data to validate potential use cases or new business models. By using a blockchain-powered platform, sensible data can be processed in use cases without the need to give access to confidential data. Even after a collaboration decision has been made, the partners do not have to give up their data ownership, but can also connect and share data via a safe and trusted decentralized platform. This solution therefore helps companies to fulfill their need to cooperate for innovation, while still protecting their intellectual property.